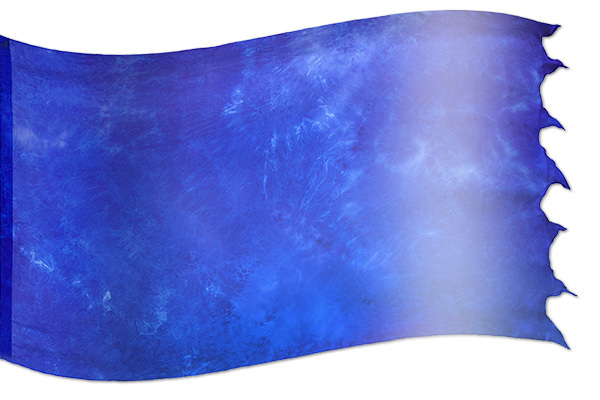 Blue represents spiritual insight into heavenly things and the nature of God. The blue in the tabernacle refers to Jesus as Son of God, the way John’s gospel reveals Him. Blue is considered the “Jehovah colour.” Mary, the mother of Jesus, is usually depicted wearing a blue robe, as she represents the meeting of heaven and earth. The high priest’s robes were made of blue. It was the job of the high priest to appear before God as the reconciling mediator on behalf of the people. Jesus is our high priest (Hebrews 7:25-27). In the same way that Christ ever lives to make intercession, so we are called as priests (Revelation 1:6) to live intercessory lives and to bring reconciliation between God and man (Exodus 28:31). Hope, peace, authority, the river of God, divine revelation, faithfulness, Holy Spirit, integrity, loyalty, truth and justice. Blue and Yellow are paired to represent God’s influence on our thoughts. Throughout Scripture, we see how God uses colours to communicate with mankind (Exodus 28:5). In particular, God spoke a promise to us through the colours of the rainbow after the flood (Genesis 9:13). Since God is light and in Him there is no darkness at all (1 John 1:5), these rainbow colours might be seen to represent aspects of His total character. James 1:17 tells us that every good gift comes down from the Father of lights (plural). The Holy Spirit is ushering in a new dimension of worship which involves the use of colour in banners and garments. The Holy Spirit manifests himself as the seven fold spirit of the Lord in Isaiah 11:2 "And (1) the spirit of the LORD shall rest upon him, (2) the spirit of wisdom and (3 the spirit of) understanding, (4) the spirit of counsel and (5 the spirit of) might, (6) the spirit of knowledge and (7 the spirit) of the fear of the LORD”. The seven colours of the rainbow can be seen to represent the Holy Spirit in His seven characteristics just as the temple lampstand, or in Hebrew "menorah", does according to Isaiah 11:2 and Revelation 4:5. 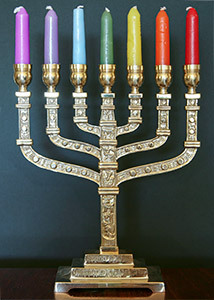 The seven colours of the rainbow have been linked to the seven branches of the menorah following the traditional Hebrew pattern of reading right to left, beginning at the centre candle. “You shall make the robe of the ephod all of blue.” Exodus 28:31 (NKJV). Please switch to our Aussie/NZ site. 'Their stronghold will fall because of terror; at sight of the battle standard their commanders will panic,' declares the LORD, whose fire is in Zion, whose furnace is in Jerusalem. O my love, you are as beautiful as Tirzah, lovely as Jerusalem, awesome as an army with banners! May He remember all your sacrifices and accept your burnt offerings. May He give you the desire of your heart and make all your plans succeed. We will shout for joy when you are victorious and will lift up our banners in the name of our God. May the LORD grant all your requests. Lift up a banner in the land! Blow the trumpet among the nations! Prepare the nations for battle against her; summon against her these kingdoms: Ararat, Minni and Ashkenaz. Appoint a commander against her; send up horses like a swarm of locusts.